By Stephen Carpenter Celebrate the holiday season with this musical board book. Children can press the button and sing along to "Dreidel, Dreidel, Dreidel". Before I even opened this attractive book for young children, I was impressed because they were using the "ch" spelling for words dealing with the holiday. (Someone once compiled a list of all the spellings of Chanukah but the "ch" still wins my vote.) After an introduction about the holiday, this project book provides ideas for making chanukiyot (the proper word for the candle holder), decorations, patterns, templates, stencils, card and gift ideas and games and puzzles. Children 6 and up and their parents should find hours of activities in this book to make the holiday more meaningful. Teachers will also find new, special ideas presented here. This book will be a distinctive addition to one's collection of activity books. By Ellen Rubin & Janet Zwebner A Hanukkah book in 8 parts for 8 days of fun. Each book focuses on a different aspect of the Hanukkah story. By Sheldon Oberman A grandfather gathers his family around him, first to tell them the story of Hanukkah and the Maccabees' victory over the Syrians. He also tells another story of Hanukkah, his own story of persecution and hiding as a Jew during World War II, unable to celebrate the holiday in the open for fear of arrest. He tells how he fought the Nazis like the Maccabees fought their oppressors. When he returns to his hometown and sees the destruction the war has caused, he experiences his own miraclehe finds his family's Hanukkiah (or menorah) gleaming up through the ashesa miracle as precious to him as the miracle of the temple's oil. The man's granddaughter, Rachel, promises to pass on the stories in just the same way to her own children. The prose has a poetic quality, and the impressionistic artwork, done largely in pastel shades of acrylic, serves the story well. The warm palette, the soft focus of the rounded figures, and the effective use of shading capture the natural light in some scenes and the illumination of the candles' flames in others. The colored backgrounds for the double-page spreads have a dappled look of handmade paper. Endnotes give additional information on both the history and current traditions of Hanukkah. A solid library selection. By Myra Shostak A small, sturdy board book introduces Chanukah to young children. "Rainbow Candles, I see One, Chanukah has just begun." A little girl counts and the number plus the requisite number of lit candles are show at the top of the page. Also depicted are activities such as playing with a dreidel and making latkes. By Marci Stillerman As the last night of Chanukah draws to a close, Oma once again tells her grandchildren the story of the treasured little menorah, "the Children's Menorah," miraculously created out of self-sacrifice by the women in a Nazi concentration camp. Softly colored illustrations depict the joyful contemporary Chanukah celebration, while muted browns and grays dominate the camp scenes in this respectful and dramatic narrative. By Johnny Zucker This charming picture book for younger children describes a typical family's celebration of the Jewish Festival of Light. After Dad reads the kids a story from Jewish history, the family sings and lights the candles. The kids spin their dreidels, and all exchange gifts. At last the family sits at the dinner table, where they eat, drink, talk, and laugh. This delightful picture book depicts a typical Jewish family as they celebrate one of the year's most important holidays. The traditional warmth of the Jewish holidays are reflected in cheerful and attractive little stories that speak not only to Jewish children but to boys and girls of all faiths. On the last two pages of each book, the traditions and meanings of the holiday are summarized for parents to relate to their children. There are attractive color illustrations on every page. By Peninnah Schram It was the fifth night of Chanukah, a cold and dark winter evening in this particular village. The only light to be seen came from a makeshift potato menorah burning brightly in the window of a modest cottage. The family inside was about to enjoy their humble feast of latke-kugel, a Chanukah favorite, when a curious stranger knocked on their door. Because of their sharing and generous nature, the family was blessed with enough treasures to make their simple celebration last all eight nights - as the oil did in the Jerusalem Temple long ago. In the tradition of other Elijah Stories, this charming tale includes gifts, stories, blessings, mysterious smiles, and the recounting of wishes granted. Throughout the story, both reader and listener are taught important lessons of welcoming the stranger (hachanasat orchim), bringing glory and beauty to every mitzvah (hiddur mitzvah), generousity, and the real meaning of giving presents on Chanukah. This is a wonderful Chanukah book that belongs in every Jewish family's library. By Michael J. Rosen One crescent moon glows in the sky. Two headlights shine through the window... On each magical night of Chanukah, a young boy and his sister count more lights shining all around them! Join them as they discover what it means to celebrate Chanukah in a world filled with so many other lights. And look carefully at each of Melissa Iwai's delightfully playful illustrations, in which an ever-growing number of cats and cleverly hidden objects serve as reminders of each day's joyous Chanukah celebration! This gentle and fun-filled exploration of the meaning of Chanukah reminds families everywhere that the warmth of the holiday extends far beyond the menorah. By Jaques J. M. Shore A beautifully illustrated children's book, Menorah in the Night Sky draws on the miraculous events of Chanukah - the Festival of Lights - and tells the meaningful, yet simple story of two young boys, best friends in a lonely camp during the Holocaust, who discover their own Chanukah miracle. Looking to the stars each night, to provide the spark of light in place of the nightly Menorah candle, the two boys learn the value of hope and the miracle of faith. A story of friendship and light, full of warmth and hope, richly illustrated and vividly told, Menorah in the Night Sky brings to life Zev and David, and their hopes and dreams, in a way that all children, and their parents too, will enjoy. 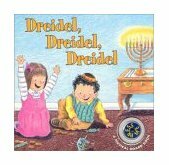 By Barbara Soloff Levy Youngsters learn about a Jewish holiday called Chanukah with the help of this easy-to-read text and 12 stickers depicting Chanukah-related objects. By Carolyn Ewing Two blank cards�framed by borders of dreidels or stars�along with 15 full-color stickers for creating greeting cards. By Evelyn Loeb This astoundingly charming - yet strange - keepsake book retells the Hanukah tale with the cats as the Jews & the dogs as the Greco-Syrians. Brilliantly capturing the spirit of the tale in both text and illustrations, Dreidelcat is a book I would highly recommend for children of all ages, at any time of the year. Adults would also like its off-kilter take on Hanukah as well. Be sure to check out the wonderful drawings of the cat with its whiskers cut off, the dogs riding their "army of armadillos," and the infamous cat sacrifice scene in the temple. Brilliantly conceived! Destined to become a classic!